The kids moved when we were gone! What is the likelihood that white is winning? Two friends were playing a friendly game of chess. The both have young children who they recently taught the rules and they agreed both children could help if they wished. Noah, the child of the father playing black said "I took their piece. I saw Jane (the child of the father playing white) make a move as I left the room but I have no idea what it was. Both friends knew that by piece Noah did not mean a pawn and that him capturing one piece was no more likely than capturing another. They also knew that if Noah played Bxd4 Jane surely responded Qxd4. If Noah played Bxf4 there was an 80% chance, Jane would have moved her knight and 20% she would have done something else. If Noah played Bxf4 and Jane moved her knight the likelyhood of her moving it finding the best square would be (2/n) with n being the number of legal knight moves. All other sub optimal knight moves would share the same probability. 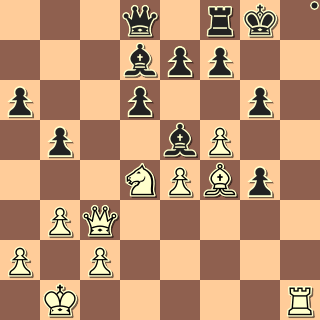 What is the likelihood (in percentage terms) that white is winning the game?